Internet Success travels the American Northwest searching for treasures in people, places, events and the refreshing beauty of breathtaking creation valued by local and international sightseers. We are pleased to introduce you to communities, spectacular sights and special moments in time as we share our discoveries through our developing series Northwest Passages. Northwest Ford Commercial is GREAT! You gotta see this commercial. Not quite business as usual. This is what you call "Customer Service"
We found this bookstore by accident as we were travelling to the Washington Coast. 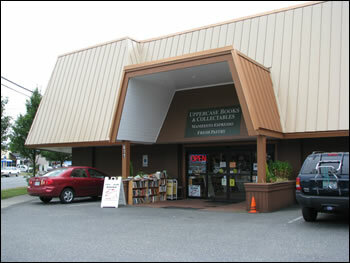 It is a charming store, with in-house coffee, reading chairs and set up for those who love to browse shelves of books. 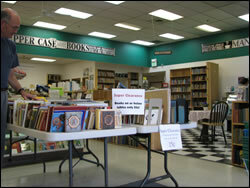 The non-fiction is separated from the rest by being found upstairs. The staff are friendly and helpful. Definitely recommended. Our journey begins with the "Niagara of the West" - Shoshone Falls. Behold the beauty and radiance of this powerful waterfall which cascades 212 feet to the canyon floor. A flash slide presentation accompanied by the music of Pacific Northwest recording artist and pianist Michael Allen Harrison offers an amazing view of this geological spectacle located 130 miles east of Boise, Idaho. Stone Works by Andy. While visiting downtown Boise one Saturday morning, we were pleased to discover photo frames created in stone. Andy Spencer, owner and artist, has been doing stone work for over 20 years. His beautiful natural stone creations were on display at the Boise Farmers Market. Read more..
Cle Elum and Roslyn, Washington stand out for their majestic mountain scenery, home of the hit TV show Northern Exposure and the hospitable atmosphere enjoyed at the Sunset Café, who proudly declare their tradition "Five generations of handmade food, prepared by our family, for your family ~ a generation above the rest!" Internet Success shares the beauty in a flip book flash presentation. Spray Paint Can Art - While visiting the Western Idaho State Fair we were amazed to see a unique artist, Matthew Sorensen, Rattle Tag Artist from the City of Blackfoot, Idaho. This revolution in entertainment through art form performs throughout the western United States. Matt is a performer and muralist for home or business, inside and outdoors. Truly amazing talent.